On Thursday, TransLink will be holding its AGM and an open board meeting. In preparation, the agency has posted several reports online. Back in the summer of 2014, there were two major service interruptions to SkyTrain. This was followed by several smaller interruptions. TransLink ended up commissioning an independent review of the SkyTrain system which resulted in 20 recommendations to reduce the frequency and duration of service interruptions, improve the safety of the system, and enhancing customer communication. As of June 6, nine out of the 20 recommendations have been implemented. 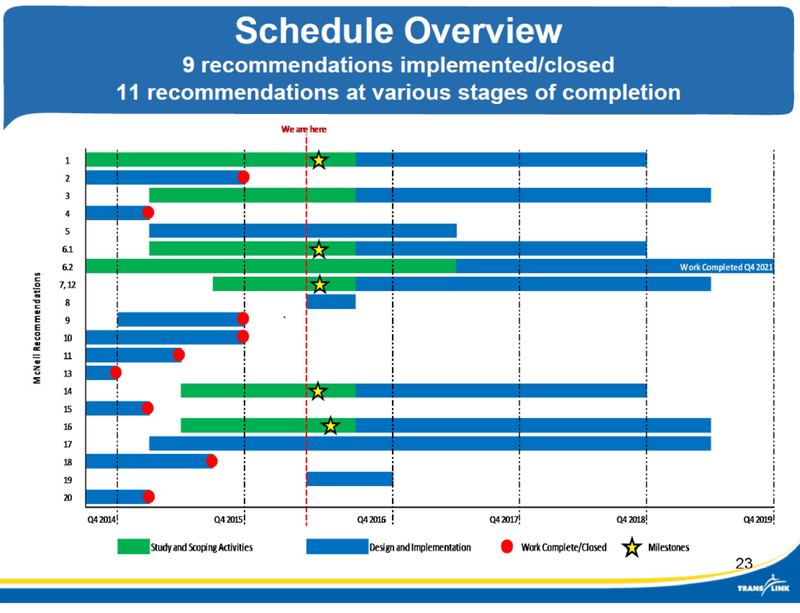 The following chart shows progress made, and estimated completion dates of all recommenations. All projects are planned to be completed at the end of 2021. 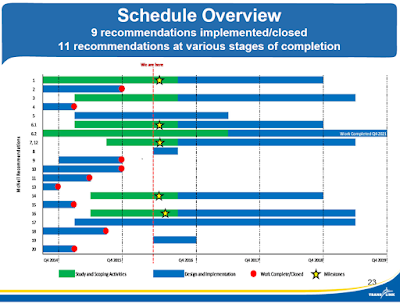 Progress status of implementing SkyTrain independent review recommendations. Select chart to enlarge. Install an auto re-started component to the SELTRAC technology package: Completing business case and getting quotes for upgrade. Also replacing copper communication cables with fibre optics. Modify the Line of Sight Operating Rule to allow manual operation of multiple trains at one time: Completed. Install system continuity redundancies for critical system elements: Draft feasibility study completed, working on funding document to allow implementation. Work on system-critical control components should only be allowed during non-revenue operating hours: Completed. Updated and create new operating and maintenance manuals and procedures: Work in progress, should be completed by June 2017. Decouple important systems and develop an asset management plan: System Architecture review should be completed at the end of this month. Assessment Manage Plan in progress. Upgrade the guideway intrusions system: Platform intrusion system repaired which cut false alarms in half. Draft study on additional improvement being reviewed. Introduce a single emergency radio band for all of TransLink’s operations: Draft report scheduled to be completed by the third quarter of the year. Establish an “alarm-based” warning system for appropriate management and supervisory staff: Completed. Set frontline staffing level and their service area locations so qualified staff can respond within a specified period of time: Complete with 30 part time staff providing additional coverage during peak travel periods. Install system-wide CCTV coverage: No longer required. Install platform edge CCTV coverage: Rolled into item 7. Communicate during lengthy delay that windows can be opened on some trains: Completed. Delineation of walkway edges on SkyTrain guideway: Draft report on moving forward to be completed this month. Increase visibility of frontline staff: Completed. Improve the quality of the PA system: Speaker being replaced on old SkyTrian cars to be finished this month. Signal quality tests completed. Working on acoustics studies. Introduce programmable messaging signboards, fixed signage and PA speakers at the entrances to all stations: Will be completed along the Evergreen Line in time for opening. New signs for Expo and Millennium Line to be installed starting in 2017. Strengthen the resiliency of the Call Centre phone system and webpage: Completed. Establish protocols and communication links with local municipalities: In progress. Introduce a bus scrolling message advising of major delays: Completed. Sometimes when governments and government-controlled organizations complete independent reviews, it is because it is the politically expedient thing to do. After a year, these reviews tend to be forgotten. I’m happy to see that TransLink has taken the recommendations from this review, and are implementing them. With the exception of item 6, all the recommendations should be implemented by the end of 2019. Thanks for sharing this. I did a reliability anaylsis on the skytrain system a couple of years ago, but hadn't heard of this initiative. A few of the projects have the right words in them, but as with all these things, the devil's in the details. Once this gets largely completed I'll have to (yuurrghh) update my analysis and see what comes of their work.